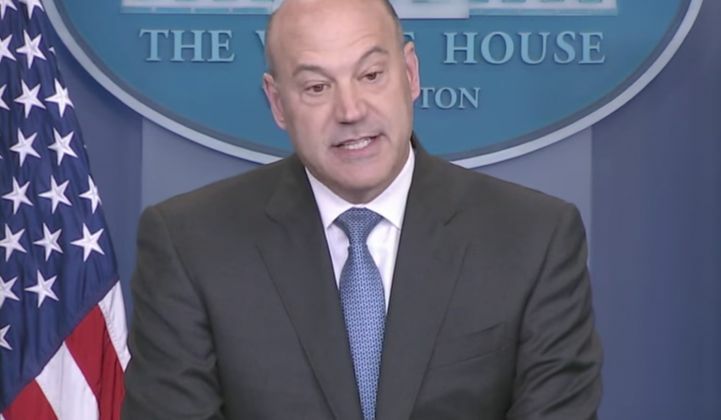 Donald Trump's top economic adviser, Gary Cohn, thinks natural gas, wind and solar are the future of energy in America. But he's getting attacked for doubting the future of coal. Speaking to reporters on Air Force One last week, Cohn expressed skepticism about reviving the beleaguered coal industry. "Coal doesn't even make that much sense anymore as a feedstock. Natural gas, [of] which we have become an abundant producer [and] which we're going to become a major exporter of, is such a cleaner fuel," he said, according to press pool reports. "If you think about how much solar and wind we've created in the United States, we can become a manufacturing powerhouse and still be environmentally friendly." Cohn is the director of the National Economic Council. Trump may dig coal, but Cohn apparently does not. His comments were immediately lampooned. "The wind and solar industry has been built on the backs of American taxpayers and yet still produce a tiny fraction of the energy we consume in the U.S., significantly less than coal. President Trump is a successful businessman who understands the severe impacts that the policies of politicians past have had on working-class families in the American Rust Belt. He hardly needs to evolve on this subject," wrote Thomas Pyle, the former leader of Trump's transition team at the Energy Department, in an email to Axios. In an interview with Breitbart News, Senator Joe Manchin, a Democrat from West Virginia, said he needed to "work on Gary and give a little history lesson." “Yeah, Gary, I don’t know what the hell happened with Gary. Jesus Christ, what’s wrong with these people?” Manchin told Breitbart. The reaction to Cohn's comments offer a window into the debate over climate policy currently swirling inside the Trump administration. Alongside Rex Tillerson, Ivanka Trump and Jared Kushner, Cohn has been lobbying the president to remain in the global climate deal. He is also reportedly receptive to a carbon tax. However, Steve Bannon and his allies within the White House are pushing back against Cohn. According to Axios, his opponents refer to him as "Carbon Tax Cohn" and "Globalist Gary" because of his position on climate policy. Breitbart -- the alt-right media organization that Bannon once ran -- is amplifying criticism of administration officials who want to remain in the climate deal. However, the outlet is more nuanced on the idea of supporting renewable energy, as Cohn also suggested. Speaking on his radio show in March, Breitbart Editor-in-Chief Alex Marlow praised the idea of developing renewable energy: "It's simply more efficient, it's better for markets, it's better for the environment in general. Not because we're so focused on climate change," he said. The president is expected to make his final decision this week on whether to withdraw from the Paris climate agreement. European officials say a withdrawal could create "lasting damage" in diplomatic relations between the U.S. and the rest of the world. Cohn told reporters that the president's position on climate is "evolving" after meetings with European leaders during his first international trip. "He feels much more knowledgeable on the topic today. He came here to learn; he came here to get smarter."